Each year creative agency We Are Social delivers its massive annual report about the latest digital trends in internet, mobile and social media usage – and now the company is back with an updated collection of insights and statistics reflecting the world’s most recent web developments in 2017. 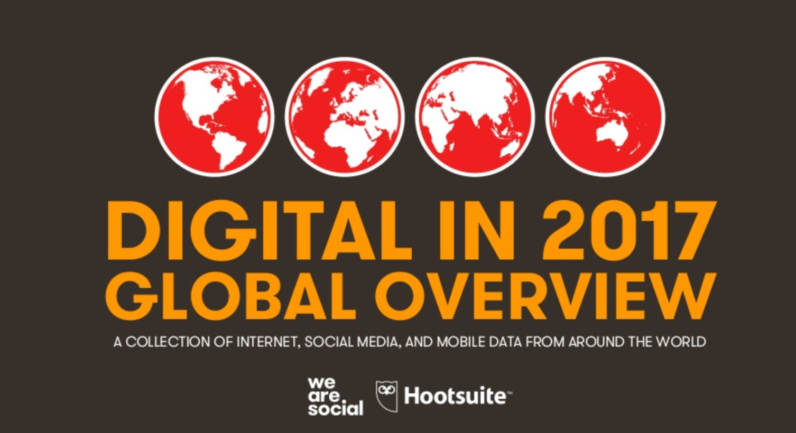 Teaming up with social media help tool Hootsuite, the agency has crunched data from 238 countries to put together 106 pages of the latest stats and trends in the digital world. Right off the bat, 2017 marks a major milestone in web usage as half of the world’s population is now connected to the internet. This accounts for a 10-percent increase in the total number of web users compared to last last year. Social media has also seen a healthy growth of eight percent year-on-year to score an impressive total penetration of 37 percent. To give you some more context, 2.539 billion of all 2.789 billion social media users came from mobile. While the United Arab Emirates leads the charts when it comes to internet access with an impressive 99 percent of its citizens surfing the web, the report suggests North Korea is the world’s least connected country with internet users making for less than one percent of its total population. In case you were wondering, this equals to approximately 16,000 North Korean citizens. In line with the larger trend on the internet, We Are Social indicates that mobile browsing currently accounts for half of the world’s web traffic, noting a 30-percent increase in mobile usage year-on-year. Needless to say, laptop and desktop devices mark a 20-percent decrease in usage, dropping to 45 percent of the entire web traffic around the globe. For more insightful data and stats about the latest digital trends in internet, mobile and social media usage, check out the full report below.